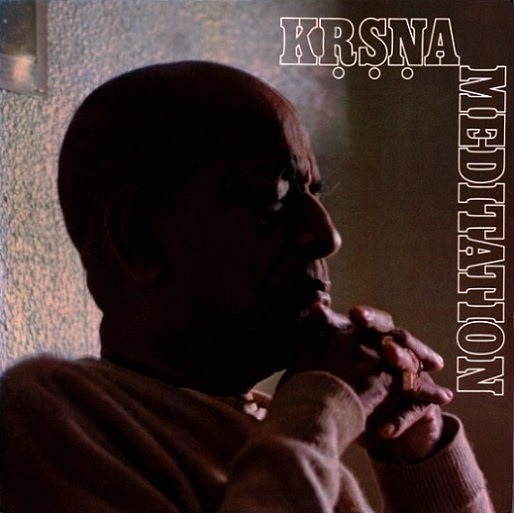 Click here to listen to Srila Prabhupada sing "Jaya Radhe Jaya Krishna" from the above album. Interviewer: Does the method include meditation? What... How do you go about this process? Prabhupāda: Our process is... It is also meditation. But as you understand by meditation, that concentrating the mind upon some super subject matter, the same thing is there, but we don't try to concentrate the mind artificially. But our, this chanting process immediately attracts the mind. Our process is... Just like Hare Kṛṣṇa Hare Kṛṣṇa Kṛṣṇa Kṛṣṇa Hare Hare, Hare Rāma Hare Rāma Rāma Rāma Hare Hare. We chant it in melodious song. So mind is attracted, and we try to hear the sound. That means my mind and my ear is compact in that thought. Therefore it is practical meditation. Interviewer: And there is a great deal of the repetitive chanting involved then in the meditation? How much is preaching? Supposing you were going, you are gathered together to accomplish this approach to consciousness. What happens? Do you speak with your disciples? Interviewer: And do they raise questions or is it a formalized ritual? Prabhupāda: Yes. First of all we pray to God to help us in the, our, I mean to say, preaching or chanting process. Then we begin chanting this Hare Kṛṣṇa Hare Kṛṣṇa Kṛṣṇa Kṛṣṇa Hare Hare, Hare Rāma Hare Rāma, conjoinedly, congregationally. And it immediately transfers the atmosphere to a spiritual feeling, and if you sometimes attend our class, you can see practically how the boys and girls, they become ecstatic and chant and dance. So after chanting and dancing for a few minutes, say, fifteen to twenty minutes, then we speak something from Bhagavad-gītā and Śrīmad-Bhāgavatam about theology and philosophy, ethics, morality. Then again we chant and pray to God and then close our class. Interviewer: Is your philosophy, your approach to consciousness, based on the Gītā? Prabhupāda: Yes. Yes, Bhagavad-gītā. This Kṛṣṇa consciousness means practical understanding of Bhagavad-gītā. This is the sum and substance. I thank you for your capturing the idea. Bhagavad-gītā is the sum and substance of the whole Vedic literature, and it is very nicely explained, things as they are. Unfortunately there are so many interpreters. They interpret the verses in their own way. That is the nonsense of the whole thing. But if Bhagavad-gītā understood as it is, oh, it is a great boon to the human society.